It’s well known that people who win the lottery aren’t necessarily happy, in fact many fall into depression when friends and family threaten them or try to control their life. Big winnings can come with big costs as greed of others hurts relationships. While so many people envy others with more money, studies show that being a giver makes people happier than being the recipient of a windfall. The specific way you spend money attributes more to happiness than keeping it for yourself. Gallop did a recent study that asked people in almost every country in the world if they were happier when they received money or when they gave it away and the answers consistently pointed to people expressing they were happier when their money benefited someone else. The amount of money people donated didn’t correlate with more happiness, but regularly using money to help others, even in small denominations made a significant difference in people’s level of happiness. DonorsChoose.org is a non-profit for mainly public school teachers in low-income schools. They post projects such as, “I want to teach Huckleberry Finn to my class and we don’t have the books,” or “I want a microscope to teach my students science and we don’t have a microscope.” Donors can but the materials for them from the site. The kids and the teacher will send you a thank you note and sometimes they send you pictures of them using the microscope. You can start thinking about “How can I spend money on myself?” and more about “If I’ve have ten dollars or 50 dollars, what can I do to benefit other people?” Because ultimately when you engage in more giving, you’ll find that you’ll benefit yourself. 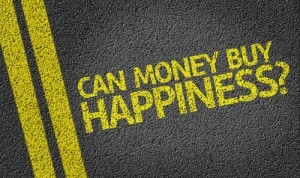 So it may be true that money can buy you happiness, depending upon how you spend it.